Olive Tree Initiative hosting International Solidarity Movement leader at UC Irvine? 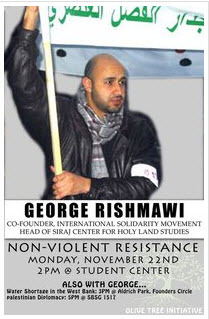 George S. Rishmawi is a leader and co-founder of the ISM, the International Solidarity Movement, and the head of the Siraj Center for Holy Land Studies (http://www.sirajcenter.org/), a Palestinian NGO that operates in the West Bank to lead educational tours about Palestine and the Israeli Occupation. Born in Beit Sahour, a city known for non-violent resistance, George S. Rishmawi is coming to UC Irvine as a guest of the Olive Tree Initiative, and for those of you interested in becoming part of OTI 4, George is one of our primary contacts in the West Bank. There will be a short presentation and ample time for Q/A and group discussion at each event! The International Solidarity Movement (ISM) is a well-organized movement that spreads anti-Israel propaganda and misinformation and voices support for others who engage in armed resistance against Israel. Founded in 2001 by American citizens Huwaida Arraf and Adam Shapiro (her husband) and Canadian-Israeli Neta Golan, ISM’s regimen involves recruiting and coordinating Western volunteers going to Palestinian areas for orientation meetings with Palestinian organizers and to discuss upcoming protests and actions. Once there, these volunteers engage in such tactics as obstructing the activities of the Israeli Army. George Rishmawi, via his local organization Grassroots International Protection for Palestinians, helps coordinate and train ISM volunteers once they arrive. Since 2001, hundreds of ISM volunteers have placed themselves in front of Israeli Army vehicles, removed concrete boundaries from roads, confronted Israeli troops, and in some cases, stayed in the homes of suicide bombers. ISM volunteers often publicize their actions and experiences in the Palestinian areas by preparing statements, articles and diaries and distributing them via the Internet among a variety of anti-Israel groups. Upon return to their home countries, ISM volunteers often describe their experiences in articles and during lectures at high schools, churches, libraries and college and university campuses. Many, though not all such speaking engagements, are organized as part of the ISM-co-sponsored Wheels of Justice bus tour. • Richard David Hupper, a Pennsylvania man who was sentenced in August 2008 to three and a half years in prison for donating $20,000 to Hamas, allegedly contributed to the terrorist organization while volunteering with ISM in the Gaza Strip in 2004. He was eventually kicked out of Israel for working with ISM, according to court documents. Hupper pleaded guilty to providing material support and resources to terrorists in May. • Two British suicide bombers met with ISM members before blowing up a popular bar in Tel Aviv near the U.S. embassy in April 2003. ISM claimed that the only contact it had with the suicide bombers “was a brief social encounter” at an ISM apartment in Rafah. However, five days before the Tel Aviv bombing, the bombers attended a memorial service in Rafah for ISM volunteer Rachel Corrie, an American college student crushed to death in 2003 while trying to block demolition of a Palestinian home in Gaza by an Israeli army bulldozer (the Israeli Army’s investigation of the Corrie death concluded that the soldiers operating the bulldozer had no intention of harming her). • More ties to hard-line Palestinian groups were revealed three months later, when ISM issued a press release inviting volunteers to “join the ISM, the Palestinian National and Islamic Forces and the Apartheid Wall Defense Committee…to block construction of the apartheid wall” during the Freedom Summer 2003 campaign. The Palestinian National and Islamic Forces is a group made up of members of Hamas, Islamic Jihad and the hard-edged wing of Arafat’s Fatah organization. By using international ISM volunteers, who return to their home countries after a stint with the group and describe their experiences in articles and at lectures, local Palestinian activists have generated international attention to their cause. ISM received its first substantial media coverage in spring 2002, when volunteers slipped into Yasir Arafat’s compound, bypassing the Israeli military that surrounded it. ISM members executed their second major action that year when they entered the Church of the Nativity in Bethlehem during a military standoff between Israeli and Palestinian forces. • Encourages activists to take “direct action” that often places them in danger and in direct confrontations with Israeli Defense Forces. • In 2006 and 2007, $55,856.20 was transferred to ISM through the A.J. Muste Institute, ISM’s “fiscal sponsor.” Middle East Children’s Alliance (MECA) also serves as a “fiscal sponsor” for ISM-USA. • Arraf and ISM volunteer Greta Berlin were organizers and spokespersons for the “Free Gaza flotilla” (May 2010) which attempted to run the blockade of Gaza and caused violent clashes with the Israeli Navy. • ISM has been responsible for endangering the safety of many foreign nationals, including American citizen Rachel Corrie and UK citizen Tom Hurndall. Both were killed while participating in ISM activities. • Involved in the violent protests against the security barrier at Ni’lin. Tristan Anderson from California was injured in March 2009 during such an event. • Attempted to help terrorists taking refuge in the Church of the Nativity in Bethlehem in 2002. • In March 2003, senior Islamic Jihad terrorist Shadi Sukiya was arrested while he was hiding in ISM’s Jenin office and being assisted by two ISM activists.